We make Plastic ID Cards to suit your budget, tel. 020 8464 2020 or click HERE to email us. We are committed to your Privacy and Security regarding the new GDPR regulations. Special price structure for Charities ID cards and ‘Not for Profit’ organisations ID Cards. Quick start up, fast and secure card printing service and delivery. Absolutely No Minimum Order, No Minimum spend. Clear visible designs for Staff, Collectors, Volunteers, Contractor and Temporary staff. Pre-printed Lanyards, Staff, Volunteer, Contractor etc, holders and clips all from stock. We understand how you need to work to a tight budget and will always strive to achieve this with you. We offer a 2 working days service for any additional cards that may be required. ID Cards or Official ID Badges identify the Charity or Organisation and are a secure proof for Staff and other associates. Start Up or New Charities, we have no minimum order, simply order more ID Cards as you grow, call us. Special price structures for Charities and ‘Not for Profit’ organisations. We can work to your budget, talk to us we will have a solution. Our professional staff will help to design the right card for the purpose. Digital images, photos & data can be sent swiftly by email or by post. We maintain a secure database for any ongoing card requirements (GDPR). 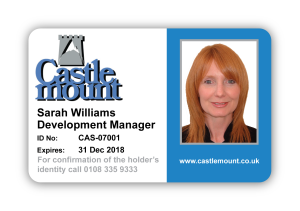 ID Cards with and without pictures for temporary or casual staff. 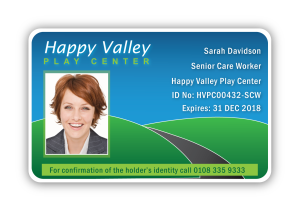 Visitor ID, temporary ID and full ID Card printing systems available. We use PVC as the core material as it’s extremely tough and durable. We can supply a list of existing similar Clients for references. ID Card service for Charities and ‘Not for Profit’ Organisations. Accessories – ID Card Holders, Lanyards, Clips and attachments all from stock and in a range of colours. 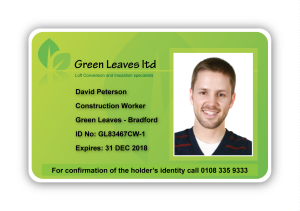 We are also pleased to be able to quote on installation or supply of a Professional ID Card System. 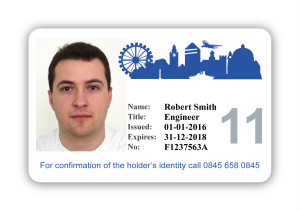 Our complete ID badge systems come with the photo ID card printer, ID card software, digital camera and blank PVC cards. Everything you need to produce Photo ID cards quickly and professionally. We are registered under ‘The Data Protection Act – GDPR’ (The Information Commissioner’s Office) for the manufacture and supply of ID cards.